Organic sugar, organic cocoa butter, organic rice powder, organic cocoa mass, emulsifier: sunflower lecithin, natural flavouring. Contains cocoa solids 42% min. Made with fairtrade sugar and cocoa. 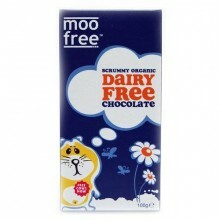 Click the button below to add the Moo Free Milk Chocolate Bar 100g to your wish list.